I’ve been doing a lot of Thesis Theme work for my clients lately. I’ve done everything from headers, to custom backgrounds and site setups. One thing that keeps coming up is that many folks don’t know how to add their custom graphics to the theme once I’ve completed them and sent them over. 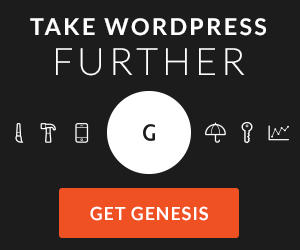 Today I thought I’d take a look at how you can add a custom background to your thesis wordpress themed website. This particular tutorial will show you how to add the background similar to how I added one to my own personal site. Step 1: Upload your new custom background graphic to the “custom/images” directory of your thesis theme installation. 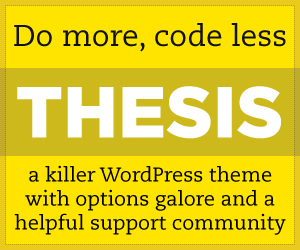 If you’re using the Thesis OpenHook plugin (recommended), you can just click on the “Appearance/Thesis Custom Styling” link in your wordpress admin to edit your custom.css file. On the page that comes up, the first editable text box will be your custom.css file. It is labeled “Custom Stylesheet” (see below). If you don’t have the plugin just navigate to your custom folder and edit the the custom.css file in the text editor of your choice. Once you’ve added that information, just save. That’s it! You should now have your new custom background graphic appearing on your page! If you want to change the background color that shows below the graphic, under the “body.custom” section, change the hexadecimal color value currently showing as “background: #000“. Change it to the color of your choice, and save! Want to see some examples of thesis headers that I’ve done? Click here! Want to learn some more about hooks before you start using thesis openhooks? Click here. Hi. I wonder if you can help me out. I trying to add a background graphic to the following site, http://ConversationtoClarity.com, but it won’t show up. Here is the code from my custom css file. I apologize. I just figured it out. Thanks. If you post a problem, and then say you figured it out, the decent thing to do is to post the solution as well. Thank you – I used this code successfully, but all of a sudden my background image is no longer loading on the site I am working on ( http://healthandnaturalmedicine.com ). I tried removing the line, but it didn’t make a difference. My background is gone, even though the code is still at the top of my custom.css file. Have you any suggestions on how to fix this? I would be very appreciative!! I’m still seeing your background image? I checked and your custom.css file doesn’t have any css included in it. You’ll need to save that file with the CSS mentioned above, and then it should work for you. It is about 60% down on that page, and I see some weird symbols around the image. I removed some weird ‘ ‘ from it and replaced it- with simple ‘ ‘ and now I have the graphic in a tile format. I would like it to be centered and only one of them that expands the entire body. I am just looking for the rays of the sun to come equally thru the background edges. do I put in a width and height 100%? I thought the no repeat, etc would have made it do this. Cool way to test for me was to open my site, background not showing up, right click and go “view background”. It then threw an error that the file couldn’t be found, which is when I noticed in the address bar the quotes were still included. I created a custom background and header for my site. Both appear perfectly in Internet Explorer, but the background doesn’t appear in Firefox, Safari or Chrome. Any ideas on how to fix that? Thanks! only difference i see are the ticks around the image url? i tried with the tags and without the tags, but to no avail still not working if anyone can help me it would be much appreciated. it looks like you have the fancy quotes, instead of the tic..
not sure if that’s the problem? Help! I have inserted the code into my custom.css, tried to change the ticks, and I have placed my paper.jpg in my own “images” directory and the “thesis_17/custom/images” directory. I can’t get the image to show up. 🙁 any help would be appreciated.